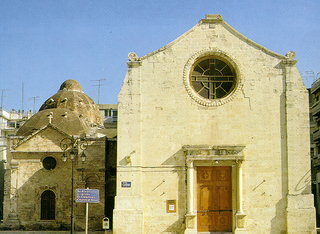 The Agia Aikaterine of Sinai Monastery, which originally was a dependency of the Monastery of the same name on Mount Sinai and today belongs to the metropolitan church of Agios Menas, was an important cultural and artistic centre of Crete under Venetian occupation, until the capture of Chandax (Herakleion) by the Ottoman Turks in the 17th century (1669). During the Venetian occupation, the Monastery housed a school, in which it is said that many important men of letters taught in the 16th century; among them were Ioannis Morezenos, Ioasaph Doreianos, Ieremias Palladas. Students of the same school were the later patriarchs Meletios Pegas, Kyrillos Loukaris, and Meletios Vlastos.